The seinstabilities lead to a nonlinear acceleration in the mass- and heat transfer, Even the effect of Marangoni-stability is provable as a damping of the eddies of the forced surface renewal. Under the condition of the balance between the shear stress and the surface tension gradient at a surface, which. 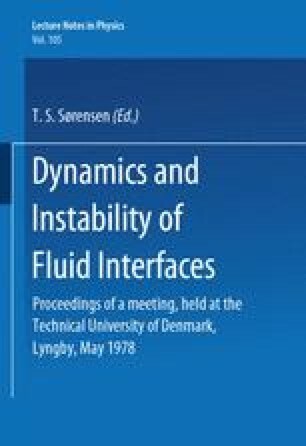 is covered with adsorbed surface active agents, there exists at low viscous surfaces a more turbulence-analogic hydrodynamic instability with stationary spatial periodic and instationary spatial and temporal periodic dissipative structures.